In 2015, Michigan’s defense was hailed as one of the strongest in the nation, led by their lights-out secondary. Wolverine defensive backs thrived under defensive coordinator D.J. Durkin last season, frustrating quarterbacks and receivers alike. Last season’s defense was among the strongest in the nation, ranking sixth in points allowed per game (16.4) and fourth in total yards allowed per game (158.5). Michigan’s secondary was the main reason the defense ranked third in the nation in passing yards allowed per game (158.5). 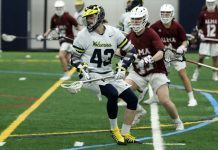 Now, in 2016, the Wolverines have an exciting blend of talented upperclassmen, experienced seniors and unproven raw talent that is poised to remain elite. All eyes were on Lewis last season to finally live up to the hype that surrounded him since being recruited from Detroit’s Cass Tech in 2013. Not only did Lewis prove himself as a shutdown corner, he planted himself in the conversation as the best cornerback in college football. Lewis set a school record in 2015 by breaking up 20 passes–an incredible feat given the storied history of the program. His speed and field vision is unmatched. Even as the receivers he covers stand much taller than the 5-feet 10-inches Lewis, he is never bullied off the ball or outreached. Be on the lookout for Lewis to rack up a few more interceptions this season with the implemented ideology of new defensive coordinator Don Brown. Last season Brown’s defense at Boston College forced 23 turnovers, a huge difference from Michigan’s 12 in 2015. Lewis has the hands and vision to not only break up a pass, but keep a few for himself. In all, expect Lewis to remain one of the best cornerbacks in college football this season. In his first two seasons at Michigan, Stribling was limited to special teams reps and spent time learning from his upperclassmen. Last season, Stribling shared time at cornerback with Jeremy Clark. 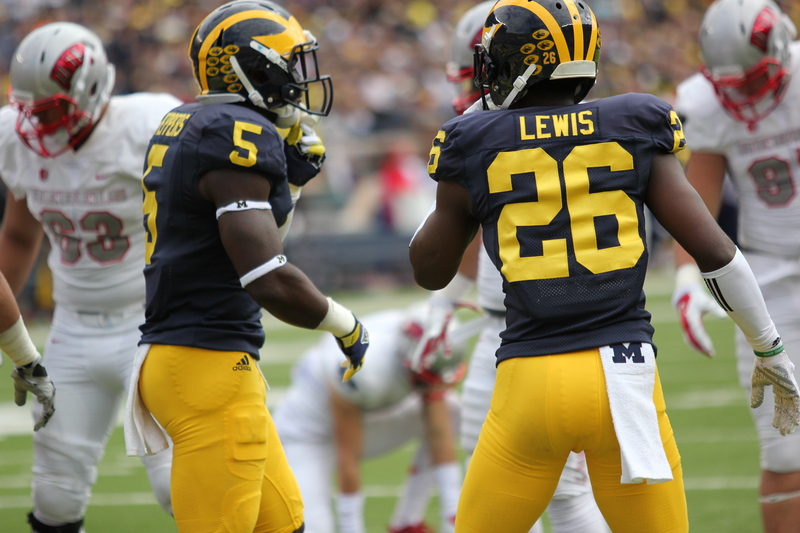 This season, expect Stribling to line up opposite Jourdan Lewis on a regular basis. Stribling was impressive when he took the field last season, displaying his athleticism and his talent at corner. Much like Lewis took his game to the next step in 2015, expect Stribling to take his game up a level in 2016 as he sees regular playing time. Stribling is likely to start over Clark this season after being benched in the spring game to curb the possibility of injury. If he did, in fact, create enough separation from Clark to take the starting job, expect a great year from Stribling. 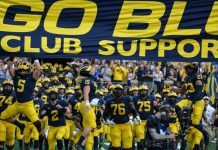 Although Clark may have lost the starting job to Stribling, Clark will have an important role in the Michigan secondary this season. Clark’s 6-foot 4-inch frame inspired the Michigan coaching staff to move him from safety to cornerback last season. While at times he could struggle picking up the ball in the air, Clark had the talent to make big plays as well; his three interceptions last season could attest to that. With last season’s experience at cornerback under his belt, Clark will be a useful asset off the sidelines to solidify the strong cornerback core that Michigan boasts. Watson can play both safety and cornerback in addition to his contributions on special teams. He will provide depth at both positions this season. With the talent in front of him this year, he will likely not get many snaps on defense barring injuries. Watson’s biggest contributions will likely come on special teams in 2016. After taking a redshirt last season, Keith Washington will probably not see the field much, if any, in 2016. His talent is still very raw, and as a quarterback in high school he is still learning the cornerback position. His speed and size is great for the future of the Michigan secondary, but barring injury expect to see Washington on special teams or on the sidelines. There is a reason Jim Harbaugh can’t stop talking about his true freshman four-star cornerback recruit from Los Angeles. Remember, Long is a true freshman. For Jim Harbaugh to speak so highly of a player fresh out of high school is extremely exciting. Just because Long is a freshman does not mean he won’t see the field. If Long can play, he will play. 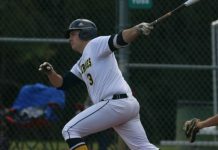 Even as he has Lewis, Stribling, and Clark ahead of him, expect Harbaugh to plug Long in this season to get his feet wet at the college level. Much like his fellow freshman Long, Hill has turned many heads this offseason. The four-star recruit from Detroit has amazing talent at the position. So much so that he’s caught the attention of teammate Jourdan Lewis who knows a thing or two about the cornerback position at Michigan. “[Long and Hill are] way better than me when I was that age,” Lewis said. “Shoot, maybe they’re better than me right now.” That’s high praise coming from one of the best in the country. As with Long, Hill will likely not see the field regularly this season with such tendered talent ahead of him, but expect some level of impact from him. He and Long will add talented depth to the Michigan secondary this season as they prepare to take starting roles next season. Last season, Hill finally came into his own and had a good season following years spent injured and suspended. In 2016, with Jabrill Peppers moving from safety to outside linebacker, Hill will assume the starting free safety position. A successful season from Hill would be to limit big plays downfield and not attempt high-risk high-reward plays. Last season, the Wolverines allowed only thirteen plays of 30+ yards which was good for third in the nation. 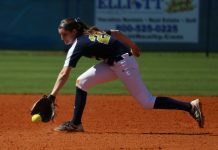 Hill will look to continue preventing huge plays for the Wolverines in 2016. Thomas was one of the most sought after recruits of the 2013 class because of his stature and pure athleticism. However, Thomas played as a running back and an outside linebacker in high school. He had to learn to play the safety position at the college level, and as he’s matured he has developed into a true weapon for Michigan’s defense. Thomas is more than capable to keep up with receivers of all sorts, but with his speed and agility Thomas can do more. With Brown running the defense, Thomas will likely have a longer leash to be aggressive and force his fair share of turnovers. Kinnel’s plan to redshirt his freshman year took a 180 last season when Harbaugh decided to toss him into special teams in the conference opener versus Maryland. Even with players like Jarrod Wilson and Jabrill Peppers far ahead of Kinnel in the depth chart at safety, Harbaugh still opted to get Kinnel playing time on special teams rather than wait a year. Kinnel, a four-star recruit as a safety from the class of 2015, will be far more than just another body on special teams this season. He will certainly see the field on defense and, depending on his performance, could work his way in with Thomas and Hill as regular safeties for the maize and blue this year. This three-star recruit might have flown under the radar to get to Michigan. Hudson was not avidly recruited during his high school playing days, but after showing up to Michigan, the true freshman might be trying to make a statement. He provides some aggressive athleticism that will be great for the depth of the safety position. Metellus is not the most exciting player on the roster by any means, but his 2016 season could be important for the future of Michigan’s defense. He is behind some impressive talent this year at the safety position and could arguably redshirt. However, with the lack of depth at the position, Metellus may end up seeing the field a few times this season to get some in-game experience under his belt for next season with Hill and Thomas graduating this year. If he were to redshirt, that would leave only Kinnel and Hudson as the only viable safeties with in-game experience next season. Overall, the Michigan defense is primed to perform at an elite level for a second consecutive season. Although depth at safety is a bit of a concern, the young reserves have the talent to keep Michigan in games if need be. The only question would be if they can produce on the biggest stages. The Wolverines may be able to run over teams early in the season, but we will learn the true toughness of this Michigan defense when they face the likes of MSU and OSU later in the year.